Onions propagate through seeds, transplants and sets (bulbs). Purchase onion bulb sets from garden centers and nurseries in the spring, which is the best time to plant onions. 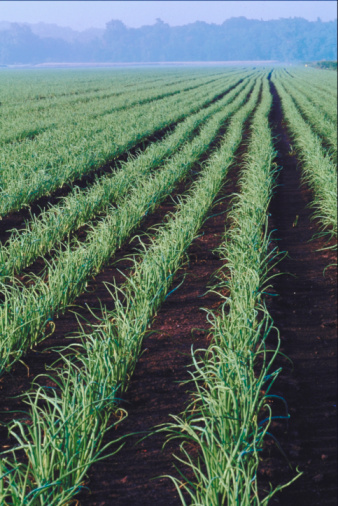 Planting onion bulbs early in the spring gives you the option of harvesting early for green onions or later in the summer for mature onions. Plant onion bulbs in your spring garden as soon as the threat of winter frost is over. Plant onion bulbs in the spring. Sort the onion bulbs by size. Pick out all of the bulbs that are about the size of a dime and plan to plant these in the same area. The small bulbs will produce large bulbs (onions). Group all of the bulbs together that are larger than a dime and plan to plant these for an early harvest of onion greens. 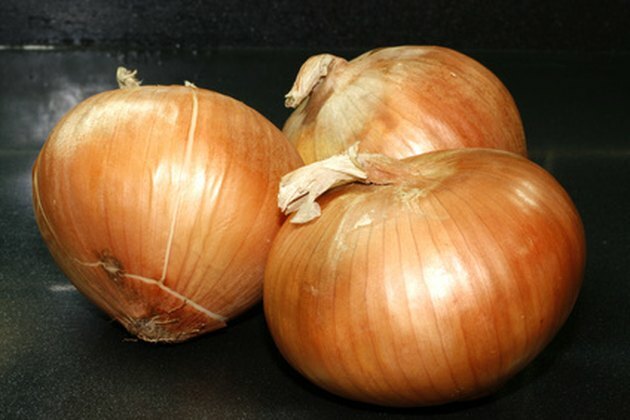 Large bulbs will not produce mature onions. Prepare the soil for planting. Onions prefer a 5.5 to 6.5 soil pH. Test the soil using a soil testing kit from a garden center or nursery. Break up the soil with a pitchfork and add the required amendment. If the soil test reveals a pH below 5.5, amend with lime. If the pH measures above 6.5, add peat moss to the soil. Add either amendment according to manufacturer's instructions. Dig holes for the dime-sized onion bulbs 2 inches deep, 1 inch apart. Dig holes for the larger onion bulbs ½ inch deep, with 4 inches between holes. Place the bulbs in the holes, neck up. Backfill the holes with the necks barely showing above the soil line. Apply a 3-inch layer of mulch around the onions to help with water retention. Mulching also reduces weed growth. Use straw or bark chips for mulch. Water the onions immediately after planting with a soaker hose. The soaker hose will force the water down into the soil for deep watering. Keep the soil damp to a depth of 18 inches. Apply a 21-0-0 fertilizer after the first watering. Apply the fertilizer according to package instructions.